Sbl-D, North Italy . Introduced in Germany in the end of the 18 th century. A small and elegant hen pigeon breed and it should have a rounded body. The tail is tilted slightly upwards, but not to the same degree as the other hen pigeons. The body position is horizontal. Neck with head, body and legs each make 1/3 of the total height of the bird. The desired length is 2/3 of the total height. Round, evenly arched, straight. Should proportional suit to the body. Good frontal which also shows width. The eye should be orange-red. By white orange-red or bull eyed. The cere is small. Dark with dark coloured, light with light coloured birds and red with white coloured birds with bull eyes. Medium length, proportionally stout build into head. Black in dark coloured, light in light coloured birds. Red Checked and Silver variants should have a dark horn-coloured beak. In Magnani the colour of the beak has no significance. The wattle should be short and delicate. From the body to the head the neck tapers gradually off. The throat should be harmonious cut out. Full and well rounded. Should form an unbroken curve from breast to tail. The feathers in the ventral area should be downy. Short, not downwards posture. Broad shoulders. Short. Covering the back well without crossing and shall rest on the tail. Shall not reach the end of the tail. Should be carried tilted and slightly upwards. As short as possible. Should not be broad, but tightly folded. Free of any feathering. The thighs are well visible. Colour of the nails has no significance. Downy feather in the ventral area. The rest of the feathers should be tight and smooth. Body colour is white. Coloured are: Head, upper part of the throat, wings included flights and tail. The head pattern ends at the back of the skull and the line of the demarcation runs in an even curve about a finger’s breath below the eye to the upper part of the throat. The short bib should - seen from front - be well rounded. When the beak is pressed down to the throat, the coloured bib should not extend beyond the tip of the beak. Permitted is: Coloured bridge in the upper part of the back and a few coloured feathers at the inner side of the thighs. One coloured respectively with patterned shield – except mottles, teagers and grizzles. With multicolour ones at least three colours must clearly be recognizable. Ever more and evenly the colour distribution, the bird is - the more valuable. Flights and tail feathers must be patterned. Males are more strongly drawn. The design becomes darker with the age. The colour more brightly or more darkly almond-yellow, partly a shade of bluish grey with flecks in all colours occurring with pigeons generally speaking plumage. The flights have 3 colors and the tail feathers at least 2 colors. The tail bar does not count as second color drawing. Silver-grey feather colour with black flecks (silverstipper). All colours purely and evenly. The black ones, red ones and yellow ones have intensive colour, the blue ones a usual colour tone. The dark ones have black - blue crop colour, tail blue with black bar. Flights are at the inside bronze coloured and black running out. With the sulphur shielded are dark body colour somewhat more brightly, and the flights are inside yellowish and dark running out. With the Silver with Sulphur Bars and the Sulphur Spangled in Schietty slightly yellowish approach is permitted at the neck and upper breast. Andalusian has black-blue head and neck colour. Chest and keel plumage as well as tail only somewhat bright, dark-blue shield with - as much as possible - black plain. Darkly running out flights and little and inconspicuous rust storages is permitted. Ligtgray Argent has a lightgray body colour, head and upper neck are darker coloured. The shield and flights darklaced. A little and inconspicuous rust storages is permitted. Ice colours have an even icecoloured plumage with black bars in shield and tail. Colour in head and neck a little darker. The pale ones have an even neck and chest colour in the appropriate colour, it means: Brown = light-brown, red = brick-red, yellow = light yellow. Blue ones and brown-pale should have a throughout-coloured tail and flight colour as well as tail bar. In Ash Red Dominant and Ash Yellow Dominant the head, neck (schietty) and chest (schietty) as well as shield have a red respectively yellow color. Keelcolor more or less brightened. The color of flights and tail light, with or without color pigments. Mealy, Ash Red Checked, Cream and Ash Yellow Checked have bright flights and tail colour. Gazzi of this colour impacts have same head and bar colour. With Schietti the head and body colour is aimed at the colour of the bars. In Teagers the pattern should be as evenly as possible. Flights and tail coloured. In Mottles with regularly more distributed coloured design. Flights in both sides and tail so regular patterned as possible. Grizzle with more or less white storages in each feather (grizzle coloured). Blue-Grizzle with black bars resp. bronze bars, Ash Red Grizzle with red bars and Silver-Dun Grizzle with brown bars. All bars continuous, evenly broadly and curved, not running together and coloured purely. 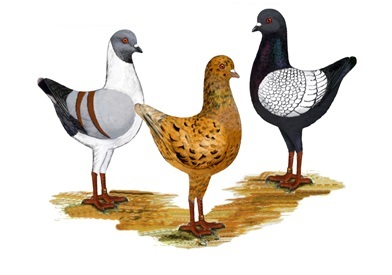 Pigeons with bronze bars have chestnut brown bars laced with a black fine edging. Blue with white bars have bars laced with a black fine edging. Sulphur with bars has bars laced with a dark fine edging. In checkers and spangled the pattern is supposed to be pure and even throughout the shield area, and as sharply as possible, not too fully and not too open, and coloured purely. The feather tip shows triangle in that respective feather colour. Also in the Dark Checkered the drawing on the shield should be as evenly darkcheckered as possible and with or without lacering. With Bronze-Checked the checking is laced with a black edging. Bronze has a brown shield. The clear ones are more brightly (deer-brown) as the laced ones (chestnut-brown). The Sulphur-Shielded has a ochre-yellow shield. Argent has white shield colour, and like the Bronze- and Sulphur Laced each feather is encircled of a fine edging in the respective (consolidated) colour (in blue it is black). Pale ones should have a bright, pure, not cloudy shield with bars in the head colour, except Silver with sulphur bars, which are light yellow. Finch design is permitted in all laced colour impacts, as well as Bronze and Sulphur shielded. Oversized, clumsy or too long body; split breast; sloping attitude, too flat tail attitude; broadly carried or open tail; too much thick, too much thin or too short neck; too short legs, x-legs; broken underline; flat crown (top of the head); pointed forehead; bull neck; too long or too thin beak; coarse or red cere (except White with Dark Eyes); very haired or loose feathers; hanging wing; too dull body or pattern colour; argent with strong arrow design; with closed flights visible easily grey coloured or rust; impure bar colour. Uneven, too deeply handing neck and neck design; through-coloured back; coloured feathers in white body colour; white feathers in the coloured feather area; white feathers in the coloured ventral area. Strongly deviating colour or pattern. Less than 7 colored outer flights or white tail feathers withTeagers . Very uneven pattern in Teagers and Mottles. Neck mould with Argent. Bronze on the breast, neck and nape with the Dark Bronze Clear and Dark Bronze Laced. Multicoloured: Too whitish or blue body color, one-coloured neck color, flights and tail feathers; less than three colours. Missing flecks or gathered in a large area. Just as the absence of flecks or gathered in a large area; different coloured flecks as black or with a bronze approach. General impression - body form, body size and body attitude – design of legs and neck form - head - eye colour and cere - colour and pattern. With the desired body markings and one white flight feather and / or tail feather then the pigeon is mottles. To get the highest rating (97 points) the flights in both sides and the tail have to be mottled. Highest worth on pure colour of the feathers on all teager and mottles. In practice, this scenario is - with any other benefits - in the absence of drawings (white feathers) in tail or one side of the flights, listed as a wish, and can be rated up to 96 points. If the drawing is missing in one side of the 2 flights and the tail or in both flights, it is then 2 wishes, and thus, in other benefits, a maximum of 95 points will be awarded.